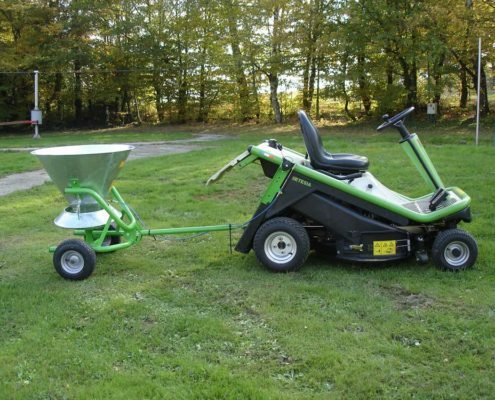 The Etesia spreader can be used for spreading fertiliser or winter work of spreading grit or sand. Fit all Etesia ride-on mower models. (Requires a tow bar). Many grounds maintenance tasks, such as snow clearance, sweeping and spreading salt or fertiliser, are seasonal activities, which often results in costly dedicated equipment lying idle during long periods of the year. With budgets being cut across the board, it makes sense where possible to purchase an attachment which can be driven off an existing power source. With its wide range of attachments, the range of Etesia mowers are cost effectively transformed into multi-tasking, all-year-round workhorses for a wide range of applications including snow clearing and salt/sand spreading. At times like this, end users realise the true multi-tasking value of an Etesia ride-on. Our accessories such as the snow plough or salt/sand spreader are keenly priced so keeping roadways and paths clear is a very cost effective operation. Our customers have discovered that for a relatively small investment they can be prepared without the need to have expensive dedicated equipment lying idle during long periods of the year. A snow blade which can be angled to the right or left and lifted for transportation between sites. Wheel (or snow) chains providing grip for quick and safe snow clearance. An easy-to-attach, quick release spreader for distributing salt or sand. For operator comfort in cold, snowy or wet conditions, there is also a glass-panelled cab with optional heater available. All Etesia accessories are easily fitted to most ride-on models in the range.